In late 2017 we designed and built a pump truck for commissioning of boosted fire hydrant systems. The search began for the ideal pump, one that could operate reliably over the next 10 years as well as perform to the requirements of a multi-story development in a city. The obvious solution was to purchase a hand pump and start a new fitness trend, however pumping water was not considered as cool as pumping iron. Plan b was to find a diesel powered engine that could run a suitably sized pump. Various manufacturers and models of pumps were assessed, with the chosen pump being the GAAM MK500. GAAM pumps are used primarily in the rural fire brigade and are renowned for their reliability and simple design. The pump is driven by an air cooled, four cylinder Hatz engine which is able to boost a hydrant system by over 1000kPa at 20L/s. With the pump selected the search began for a suitable mode of transport to carry the pump and equipment. A few different options were thrown around including a truck, van, trailer, horses and even drones were considered. Unfortunately no one at HTC was good at flying drones and even though we have a country boy working for us, he was too busy riding motorbikes to ride horses. Once again plan b was called upon to save the day. A ex-council Isuzu 200 was purchased and brought up to Brisbane to be refurbished into the pump truck. The original equipment on the truck was removed to make way for the pump and toolboxes. Dan and Tom then decided to put down the flow meters and pick up a spray gun to repaint the tray. However, the novelty was short lived, with both parties getting overwhelmed in paint fumes and covered in paint. Eventually the two finished the painting and moved on to the design and installation of the pump manifold and toolboxes. In order to commission 40L/s systems a four inlet and outlet pump manifold was designed, also incorporating a standard 125mm tank suction connection. The manifold itself was constructed out of 150mm galvanised steel to reduce friction loss. Vertical supports with vibration mounts were fixed to the pump skid to support the large manifold. The custom manifold and mounts were then painted the traditional, slightly boring, fire red. To maximise space on the truck, the pump was mounted across the tray with the inlets and outlets facing the passenger side. This also means that the HTC pump truck is able to park next to a booster and directly attach to it, without potentially blocking roads or other works. To protect the pump from rain, hail and bird droppings, a full enclosure was designed and built, along with two toolboxes to carry the rest of the equipment. The enclosure incorporates ventilation on four sides to ensure the air-cooled motor does not overheat. 240m of hose is stored in the toolboxes to connect to the booster and discharge the hydrant flows safely. Numerous fittings are also stored in the pump truck to assist with onsite investigations, if the system proves to be non-compliant. A variety of other speciality equipment including pressure loggers and ultrasonic flow-meters are available through HTC to measure tank infill rates and pressure fluctuations. 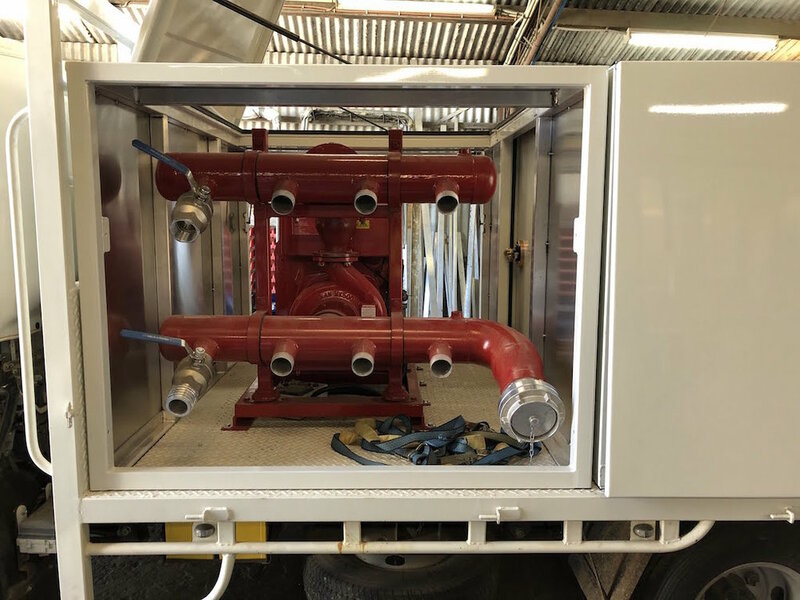 As of September 2018, the HTC pump truck has been completed and begun work commissioning hydrant systems. We thank our clients for your support and look forward to commissioning your hydrant systems in the near future. We hope HTC can continue to grow and provide you with more quality services.